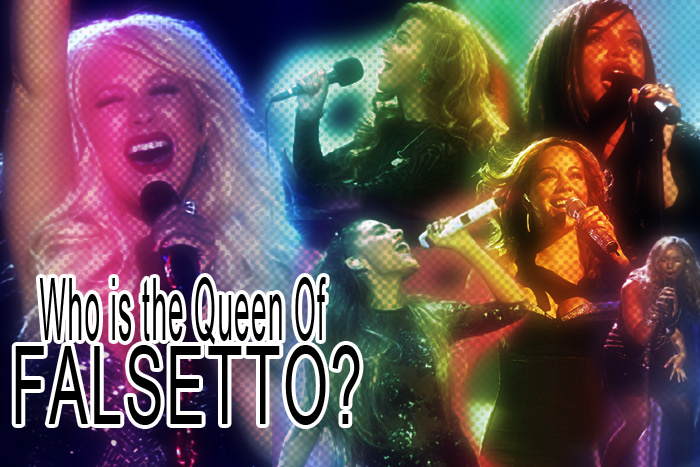 Diva Devotee: [Discuss] Which Singer Has The Most Beautiful Falsetto? [Discuss] Which Singer Has The Most Beautiful Falsetto? I know, I know! There are many vocal teachers out there that insist the female falsetto doesn't exist and that it's the head voice producing that particular timbre. But science has proven this to be untrue, so I am going ahead with the post. Take that, (more informed than me) teachers!! For our purposes, the falsetto is light, airy, dynamically retarded with a flute-like quality. It's also unconnected from the modal voice and texturally static. Of course these aren't rules set in adamantium alloyed vibranium, but merely a general list of falsetto defining properties that'll help us maintain consistency amongst our choices. Personally, I love a little falsetto. It has the range and warmth of the head voice but none of the weight, allowing it to blend better and not be so overwhelming. And since the falsetto is more oft displayed by males, feel free to cross the picket line and post some of your favourite male falsettos in the comments, too. Below are a few videos I harvested from YouTube doing a simple "falsetto" search. I haz not watched them, but they're there mainly for a little flavour. You guys are smart enough to figure out if they're legit or not with their examples. So watchya waitin' for?! Let's talk about the falsetto!